The last couple of weeks I’ve had a craving for tacos. Ground beef is finally coming down in price (a bit), but I still frequently turn to chicken. My in-laws raise chickens each year, then butcher them and dole them out among the family. As a result, we always have delicious chickens in the freezer, so we have leftover chicken from our Sunday dinners. It’s a great way to have easy, lean meat that’s ready to put into another recipe for the rest of the week. Chicken tacos is one that is very easy, delicious and is perfect for dinner. I also love the leftovers for lunch, they’re quick and easy and still delicious and healthy. One of the great things about tacos is that you can pile on all the extras you want, and if you do it right, you can still keep the points down by adding mostly veggies. It’s especially perfect for us this time of year, since we’re still finishing up our fresh salsa. These chicken tacos are a perfect weeknight family favorite. Juicy and seasoned chicken topped with queso fresco and your favorite toppings. Saute in a large skillet with the olive oil until browned, about 3 minutes per side. Place the chicken, cumin, paprika, chili powder, garlic and onion powders in a crockpot. Meanwhile, combine the onion, tomato and cilantro in a bowl. Season with salt, pepper and the lime juice. Remove the chicken from the slow cooker and shred with 2 forks. 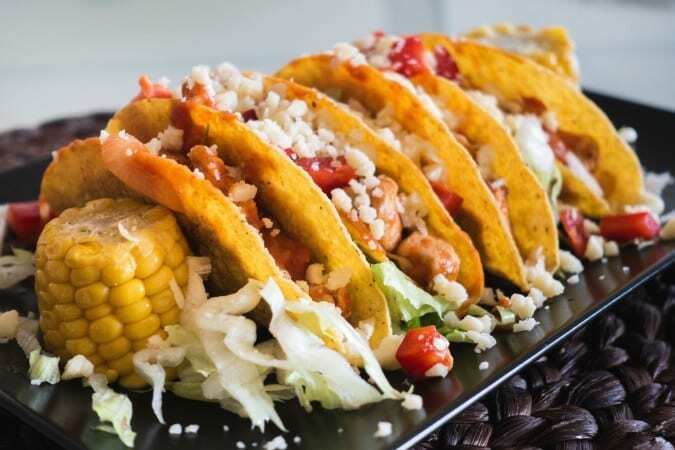 Serve the chicken in tacos shells, topped with the tomato mixture, queso fresco and toppings of choice. I have asked this before but never received a reply. Why can’t I print the recipes? When I click on “print friendly”, all I get is the intro paragraph and photo, but not the recipe. Why is this happening?? ?